I love, love, love learning about the world around me. I was taught from a young age to notice the designs in nature (God's fingerprints). So when I cut these two melons up the other day and noticed the same zig-zag pattern I was just awed. 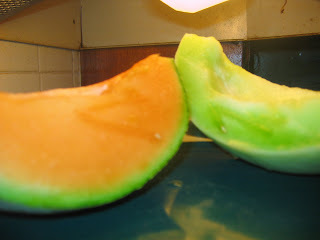 Look at the beautiful way the seed travels from the center of the melon to the outside. When it reaches the rind I'm sure it will burrow to the other side and plant itself. It is so beautiful!